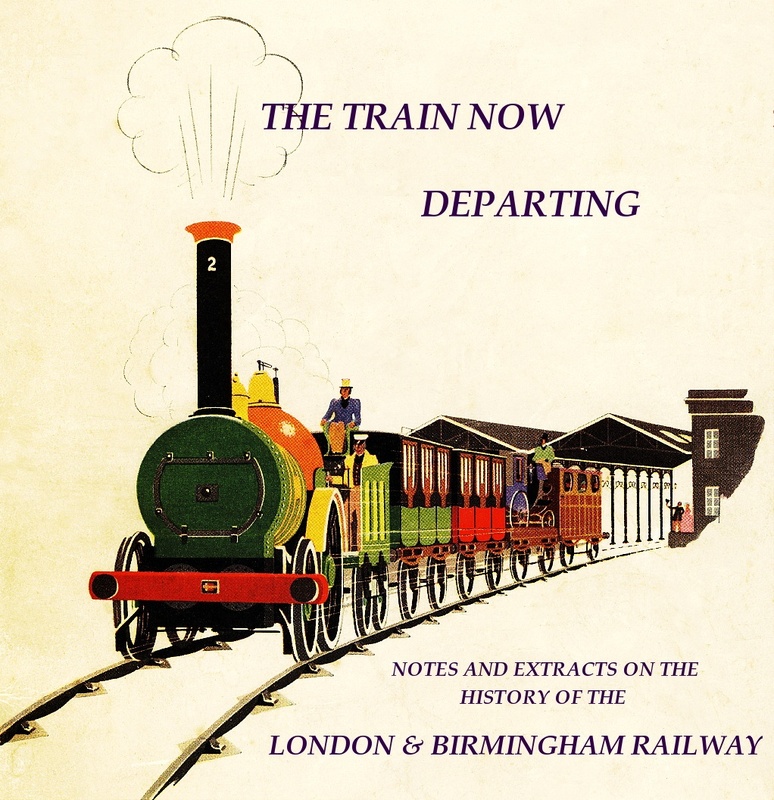 THE TRAIN NOW DEPARTING - Notes and Extracts on the History of the London and Birmingham Railway. “I REJOICE TO SEE IT AND THINK THAT FEUDALITY HAS GONE FOREVER”. . . . . so said the distinguished historian and headmaster of Rugby School on first seeing a London and Birmingham Railway train pass through the town. 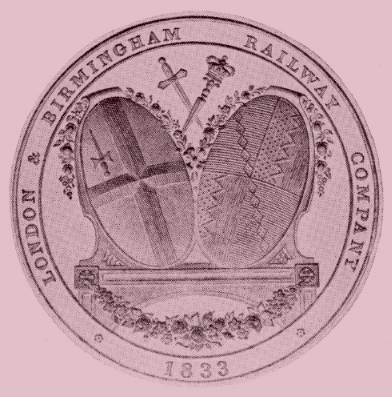 London and Birmingham Railway Company. Bronze statue (1871) by Carlo Marachetti, Euston Station. The Liverpool and Manchester Railway was our first inter-city rail link. Opened in 1830, it was an immediate success. Other railways were soon planned to exploit the developing steam locomotive’s ability to move heavy loads over distance much more swiftly than could any other means. Horse-drawn road transport was limited to the modest load that a team of horses was capable of moving, which was often further reduced by the poor state of the pre-Macadam road surfaces of that age. Inland waterways ― principally the canals ― provided a far greater load-moving capacity, but they were slow and hampered by drought in summer, ice in winter, a lack of standard dimensions that often prevented inter-working, and by the lethargic and parochial outlook of their owners. Coastal shipping was also slow and much affected by the weather, added to which direct access to inland destinations was very limited. Thus, the railways that followed the Liverpool and Manchester brought about a second transport revolution — for despite their limitations, the canals were undoubtedly the first — initially capturing passenger traffic from the stagecoach operators and then freight from the canal companies (indeed, by the 1850s railway freight revenue exceeded that from passengers). WHEREAS the making of Railway, with proper Works and Conveniences connected therewith, for the Carriage of Passengers, Goods, and Merchandize from London to Birmingham, will prove of great public Advantage, by opening an additional, cheap, and expeditious Communication between the Metropolis, the Port of London, and the large manufacturing Town and Neighbourhood of Birmingham aforesaid, and will at the same Time facilitate the Means of Transit and Traffic for Passengers, Goods, and Merchandize between those Places and the adjacent Districts, and the several intermediate Towns and Places . . . .
Preamble to An Act for making a Railway from London to Birmingham, 6th May 1833. The London and Birmingham Railway and the Grand Junction Railway (Britain’s first trunk railway, linking Birmingham to Liverpool and Manchester) opened within months of each other. Sharing a terminus at Curzon Street, Birmingham, the two railways between them provided (in comparative terms) the first high speed, high capacity transport link between the Capital and the industrial regions of the midlands and the north-west of England. We began work on the canal cutting, which we anticipated would be the more difficult to research, and such proved to be the case. For the reasons explained in the Foreword to The Grand Junction Canal: a highway laid with water, the historical account that emerged was very different to what we had planned. So when it came to tackling the railway cutting, and in order to maintain a balance between the two publications, the challenge had grown into one of producing a history of the Railway from end-to-end. The following narrative is not a history in the conventional sense, nor does it claim to be a detailed treatise on the construction and operation of the Railway; rather, as its subtitle states, it is a collection of extracts taken from books and periodicals of the period that I have placed within a framework of notes (‘linking passages’ being too wordy for the title). My aim is to provide a sketch of the events leading up to and including the construction of the London and Birmingham Railway, and of its years in operation as an independent company (1837-46) ― to include the era following its absorption into the London and North-Western Railway and beyond would have been a mammoth task; that said, I have strayed into the L&NWR period when this seemed appropriate. I hope that you find my account readable and informative. I would like to thank my friend and sometime co-author, Wendy Austin, for her help with the research. Wendy has published, in her own name, a number of titles on different aspects of the history of our town and following her return from a lengthy period of globe-trotting we were able to collaborate on another, The Railway comes to Tring. † Now the southern section of the Grand Union Canal. ‡ Now the southern section of the West Coast Main Line.